BEIJING - China's warships will soon be equipped with electromagnetic railguns, in a move that will put its fleet ahead of the rest with some of the world's most advanced weapons technology, state media reported. According to the Global Times, breakthroughs have been made by a naval engineering team led by academician Ma Weiming in multiple related sectors, national television reported on Wednesday (Jan 2). Ma, from the Naval University of Engineering in Wuhan, Central China's Hubei Province, and his team have gained innovative results in electromagnetic launching technology with fully independent intellectual property, cctv.com reported. In February, the same landing ship with the electromagnetic railgun was photographed in harbour, Beijing-based newspaper Science and Technology Daily reported. Li Jie, a Beijing-based naval expert, told the Global Times on Thursday that China's electromagnetic railgun development has reached a mature stage after a series of tests. If the recent trial run is true, it could be among the final tests before the weapon's delivery to the People's Liberation Army Navy, Li said. An electromagnetic railgun can fire projectiles via electromagnetic force at incredibly destructive velocity. It can reach farther ranges when compared with standard artillery and maintain high accuracy, military experts said. The US is also experimenting with the new weapon, but China will be the first country to actually equip it on a warship, according to the cctv.com report. China's naval electromagnetic weapon and equipment have surpassed other countries and become a world leader, the report said. 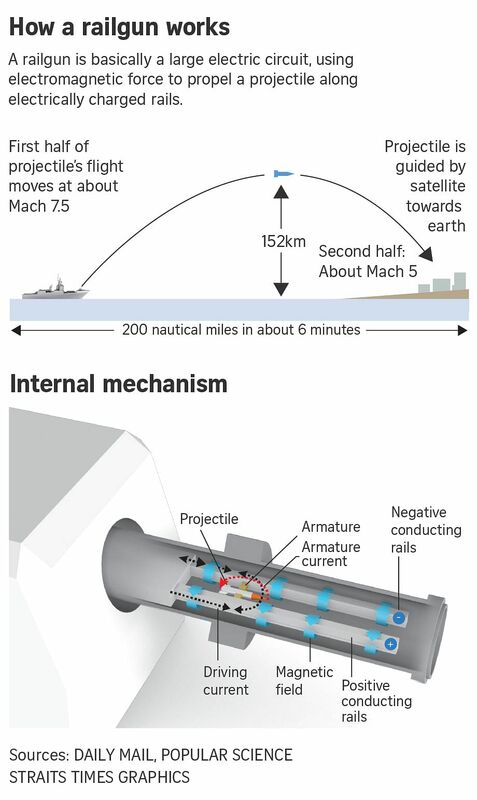 Chinese military experts expect the Type 055, China's domestically made 10,000-ton class guided missile destroyer, to use the electromagnetic railgun. Li said that the weapon could also be deployed on China's future aircraft carriers and amphibious assault ships. Military expert Carl Schuster, former director of operations at the US Pacific Command’s Joint Intelligence Center, told CNN that if the reports were accurate, the weapon was likely to be “a year or two away from being operational”. Schuster said it was significant that China appeared to be transitioning from copying foreign weapon designs to “developing their own” technology. “It also tells you (that China) is no longer 10-15 years behind (the US)... They are now approaching parity with the west in terms of weapons development,” he added.